Occupy Portland, the protest movement and encampment in downtown Portland, has used flags in interesting ways. 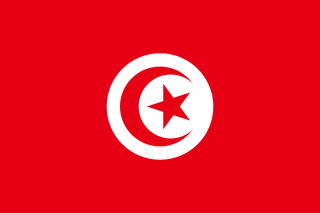 Ted Kaye observed a march in late October in which the flags used included USA, Cascadia, Tunisia, and red (IWW) and black (Anarchists). 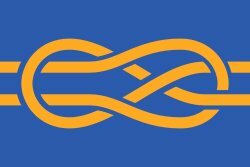 Part of a national movement, the Portland group created a logo based on the flag of the city of Portland, a wonderfully innovative use (what would Doug Lynch have thought?). 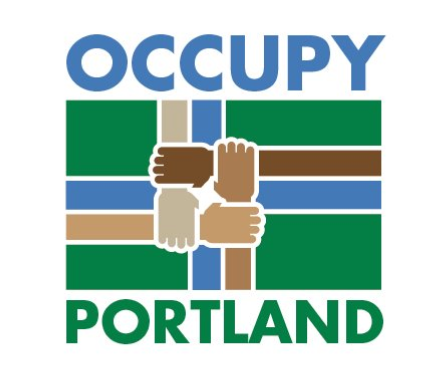 An Occupy Portland logo based on the Portland flag. This unusual “Gadsden Variant”, drawn on cardboard by an artist named Bobby, turns the well-known rattlesnake into the “99%” image reflecting the movement’s motto “We are the 99%”. A 99% variant of the Gadsden flag. Photo by Ted Kaye. The US flag was very popular, often flow upside down to indicate the nation in distress, or as a background for writing. 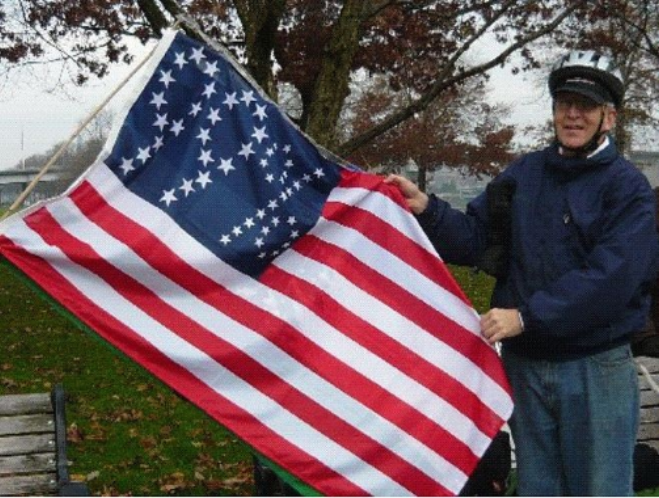 Peter Orenski’s TME Co. designed and manufactured 99% variants of the US flag and gave them away to Occupy movements across the country in return for a photograph of them in use for publication on TME’s website. One made its way to Portland via Ted Kaye. 99% US flag, designed and manufactured by Peter Orenski’s TME Co. Ted Kaye delivered this one to the Occupy Portland protesters in early December 2011 at Salmon Street Springs. Photo by Ted Kaye. TME’s “Occupy” U.S. flag variant, with the 50 stars in the canton rearranged to say “99%”; the “%” made up of smaller stars.